Increased productivity. There have been a number of studies that have found that judicious use of social media in the workplace will actually increase productivity. A study conducted by the University of Melbourne found that employees with access to social media are 9% more productive than those without. Increased buy-in. Employees like to feel trusted and empowered. If they don’t you can expect to experience higher turnover and lower morale. A good way to gain trust is to allow employees to use social media in the workplace. If an employee feels like they are trusted, they’ll be more likely to stay with the company. Recruiting. Small businesses have started to use social media for recruitment, but limit efforts to one account. If you have 10 employees in your organization, each with a social media account with 100 friends, you have the potential to reach 1,000 people. This is achievable if employees are allowed to access social media at work and are encouraged to share posts. Identification of business opportunities. Through the use of social media, employees in charge of sales and business development can source new clients and build fruitful relationships. There are many advantages to allowing access to social networks at the office. If you‘re hesitant to completely open the social media floodgates, try doing so in short periods, like the final three hours of the working day. 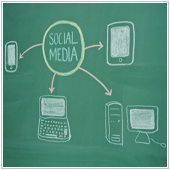 No matter what you decide, allowing access to social media is a good practice for your business. If you would like to learn more about social media and how you can leverage it in your business, we are happy to talk with you.